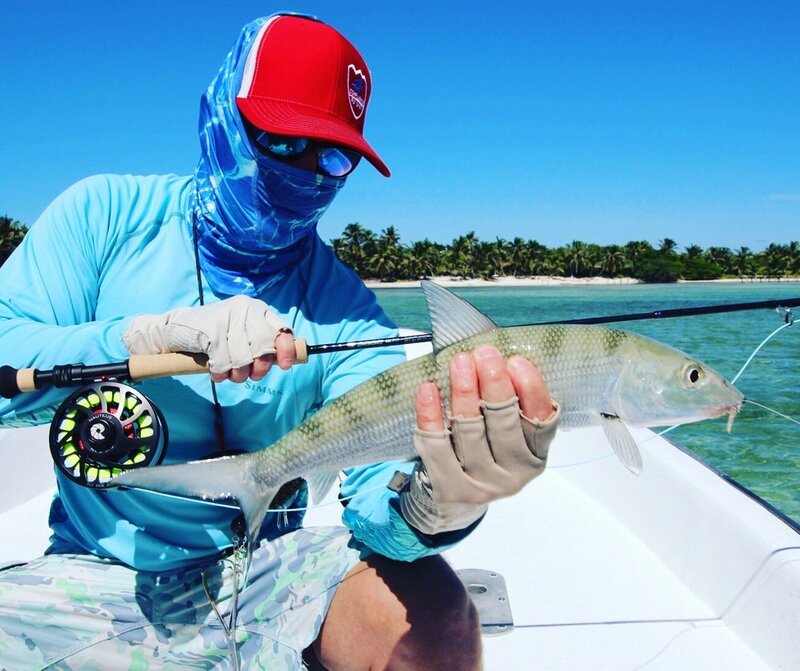 A winter Belize Bonefish trip to remember. Recently, my wife and I headed south to Ambergris Caye, Belize. This was our third trip in 5 years and this time, we decided to take our friends Grant and Heidi Jackson from Down and Across Media (www.downandacrossmedia.com). As always, San Pedro was busy a great time and we made it a point to visit some of our favorite spots. And naturally, we found our way to the flats. Fishing from the beach was actually somewhat productive for bones. Grant and I did pretty well in and around our resort area. Sight fishing, of course, was the name of the game. On day four, Grant and I went out with Belize Fly. This year, we focused our efforts on the gulf side of the island, up north-almost to Mexico. The north winds made sight fishing the flats on the lagoon (west) side of the island all but impossible. Our guide pushed us pretty hard. Admittedly, we probably messed up telling him our fly fishing history. Bad move, but it made for great entertainment and a few moments of humility. As our day progressed, we had plenty of shots at Bonefish and Permit. Both Grant and I did fairly well, hooking over 10 Bonefish and putting most to hand. I had the opportunity to chase a couple of Tarpon around, eventually hooking one and watching him snap my 12lb Bonefish leader like it wasn't even there. No, we did not have Tarpon equipment with us. Yes, we still had to try. Whoops. Overall though, I was very impressed with our guide and my new gear; the new Sage Salt HD 890-4 and a Nautilus NV-G8/9. A great flats combination that I truly think would be pretty hard to beat. The Salt HD was incredibly impressive and lived up to it's praise for speed with longer shots, punching through tough wind. The NV/G, well, it's ridiculous how powerful and smooth that reel is. The best I've ever seen. As the week moved along, we continued to do alright from the beach. I bought my wife (Montana) a half day with one of our favorite San Pedro guys, Eloy Gonzalez from Gonzalez Adventures. Montana was nice enough to let me throw a few shots at some Tarpon early in the morning. I was ready this time with 60lb leader. But, no dice this time. I sat back and watched the rest of the day as Montana then proceeded to crush it in the flats. It was basically non stop bonefish shots. She hooked something that we never saw and she couldn't get stopped without breaking off. All in all, it was a great day and an amazing trip. Good food, good weather, good fishing and good friends. Shortly after returning, Grant and I took a December two night trip down the Wild and Scenic section of the Grande Ronde. We brought a tipi tent from Montana Canvas. A wood stove, with lots of firewood kept us pretty comfortable in the temps that ranged from the low teens to the low 20's. I couldn't help but laugh on the final morning when I walked down to the raft and found her completely covered without about an eight of an inch of ice. What a difference a week makes when it comes to fishing trips! If you'd like to discuss a fly fishing trip to Belize, send me an email or give me a call. The author with a Bonefish on Ambergris Caye, Belize. Better than projected- The fall 2017 Grande Ronde River steelhead season.